Update 2: On May 26, Facebook launched new privacy controls, which will be rolled out to users over a few weeks. These instructions are for the old controls. If you have received the new controls, please use our revised instructions. Go to the Instant Personalization privacy setting and uncheck the "Allow" button. Click confirm. Come back to this page. Go to the page for Microsoft Docs, click Block Application on the page, click Block Application on the pop-up, and click Okay on the next pop-up. Come back to this page. Go to the page for Pandora, click Block Application on the page, click Block Application on the pop-up, and click Okay on the next pop-up. Come back to this page. Go to the page for Yelp , click Block Application on the page, click Block Application on the pop-up, and click Okay on the next pop-up. Come back to this page. Optional: Go to the Facebook Site Governance page, and express your opinion in a comment. Yesterday, Facebook announced Instant Personalization, whereby select websites would "personalize your experience using your public Facebook information." The initial sites are Pandora, Yelp and Microsoft Docs. As Facebook CEO Mark Zuckerberg explained, this means that when you visit "Pandora for the first time, it can immediately start playing songs from bands you've liked." Pandora, and other partners, can also link your real name and other Facebook information with everything you do on their site. Old video removed. See above. By default, the "Allow" checkbox for Instant Personalization is checked on your privacy settings. 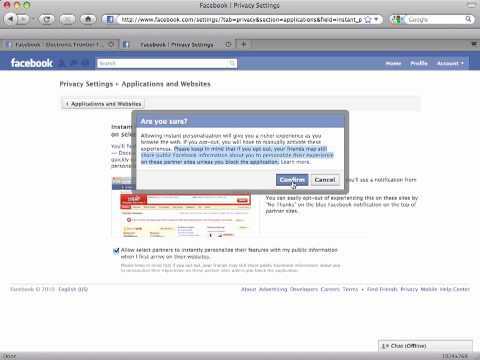 If you don't want the websites that you or your Facebook friends visit to know your information, you must opt out. Since this process is a bit complicated, we have made a quick video showing step by step how to do so. Simply unchecking the "Allow" box is not sufficient. As Facebook explains, "if you opt out, your friends may still share public Facebook information about you to personalize their experience on these partner sites unless you block the application." Nor can you go to the Block Applications setting to block these partner sites. This setting is only for showing which applications and sites are blocked, and unblocking them. So, to opt out of this fully, you also need to go each page for Microsoft Docs, Pandora, and Yelp and push the Block Application button. If Facebook adds another partner site to the program, you will need to block that as well, so be sure to check back often. You may also want to review the settings for what friends can share and sharing your profile information.